Home > Uncategorized	> Oak Hay? Well, it seems we have definitely had our summer. It lasted nearly two weeks, so I suppose we can’t complain. The wind is being a little over enthusiastic today and the trees, in the wood that rises up the hill behind the house, are jumping up and down and waving their arms around like a bunch of five year olds on a bouncy castle. They do enjoy a good breeze and the noise of their laughing and shouting quite overrides the chortling of the beck that normally greets you, as you step out into the back garden. A week or so ago, I popped in to see Sharon at aleafinspringtime in Finland, and I noticed that she had a picture of an Oak tree in flower, while there was only the merest suggestion of leaves on the Oak trees in our wood. 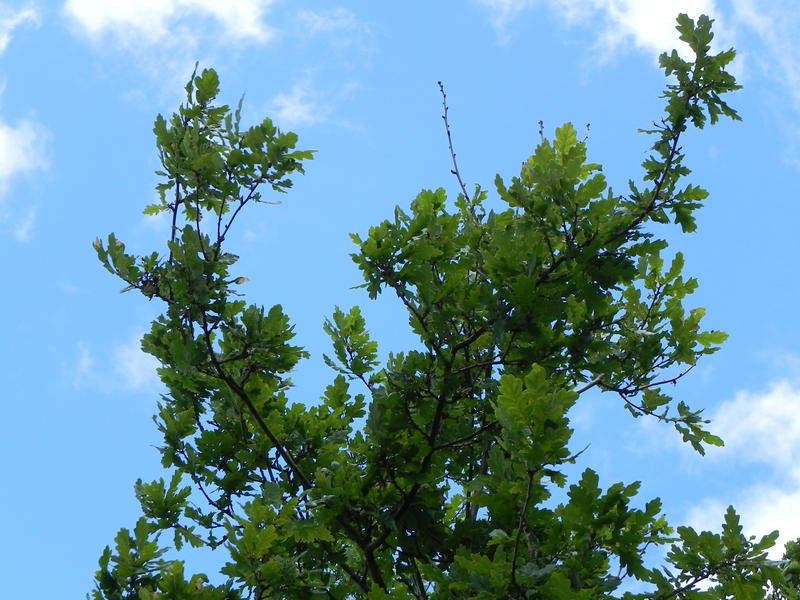 Well, now our Oaks have woken up and are properly dressed, there is no sign at all that they intend to flower this year. I could have missed it, I suppose, with winter hanging on until the last possible minute. When Spring arrived she really didn’t have time to do everything that needed to be done. There was such a rush to get on to summer and a great many things were swept under the carpet of last years leaves. I’ll keep an eye out – but I don’t think we’ll see Oak flowers this year. Thanks for the comment Sharon – I just love your photos on your blog! Those frogs!